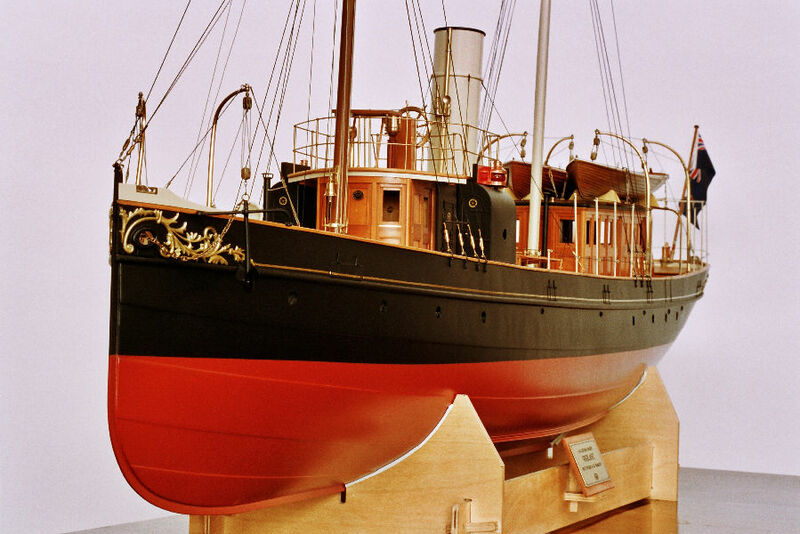 Mountfleet Highlander, 1:24 scale puffer. The Kit is very detailed with an excellent fibre glass hull and over 650 white metal castings. The latest version of the kit also contains a Roboesch brass prop and a set of crew figures. HMS Prince George was the third vessel of the Majestic class of pre-dreadnought battleships. She was laid down on 10 September 1894 and completed on 26 November 1896, and with her eight sisters she dominated the world’s oceans, they were considered to be the ‘Star Wars’ weapons of the era. The ships were 421ft long and had a beam of 75ft, displacing 16,000 tons. Armed with four 12 inch guns, twelve 6 inch guns, twelve 4 inch guns, sixteen 12pdr and twelve 3pdr guns, and in addition to this over-welming firepower she also had five 18 inch torpedo tubes. With her impressive armament the Majestic were the first to be fitted with 9 inch Harvey armour which allowed the same protection as previous battleships but less cost in weight. This meant that they had deeper belt armour thus protecting more of the ship. The ‘Majestic's’ were as revolutionary as the Dreadnought was in 1906, and were considered to be the first true battleships, making the ‘armour-clads’ obsolete like HMS Dreadnought made all preceding classes of battleships. As being built by Paul Millers. The 'Vigilant' was built for the Commissioners of Customs in 1902 for a cost of £5,390. She was powered by a triple expansion engine steamed by a single scotch boiler and attained a speed of eleven knots. Her dimensions are 100 feet, (30.48 metres) between perpendiculars, 108 feet, (32.8 metres) overall, 16 foot, (4.88 metres), beam, 8 foot, (2.44 metres), draught. She was stationed at Gravesend and used for the control and clearance of ships bound for the Port of London. She was also used by the Commissioners for Customs to inspect their posts in ports around the coast. The 'Vigilant' has an interesting history. It should be noted that the completed model shown is the prototype made by the kit manufacturers Marten, Howes and Baylis all other photos' are of my build. Derived from the First World War Thornycroft 55ft Coastal Motor Boats, these boats were essentially improved versions with a hard chine bow and a different engine layout. Powered by two Thornycroft RY12 petrol engines these CMBs could achieve 40-42knots but were relatively fragile boats. Launched in January 1941 they were delivered to their new base at Suda Bay in Crete in March 1941. Mainly operating in covert operations by dropping off agents in Crete and Greece, they were all destroyed by German bombers in May 1941 when the island was attacked. This model is built to 1/32 scale making it 7ft 3inches loa (including the rudders), beam 14inches, and only 1.5inches draught. It is powered by two 12v car heater motors each driving an in-turning 45mm propeller from Prop Shop. Due to the large size of the model I wanted to have smoke/steam pouring out from the funnels, this is achieved by two MMB big foggy units. We used two Electronize 30amp speed controllers, controlled by a Robbe F-14 twin stick Tx. Click here for more details and link to further build log.